Each day of the festival is capped off with a speaker from the birding world. Most are usually well-known naturalists and biologists who work at different conservancies around the country, but there are also photographers and other ornithologists featured. These lectures are presented in an intimate auditorium on campus that allows easy Q&A and audience participation. I’ve been to many and they are always very entertaining. The first night’s keynote featured Greg Miller. Back in 1998, Greg did what the birding world calls a “big year.” This is when a birder crisscrosses the country to see as many bird species as possible in a calendar year. Quite the achievement if you can pull it off. Especially since Greg was holding down a full time job at the time. Greg was one of three birders to each get over 700 birds that year! Phew, that’s a lot of birds! It turned out to be a heated competition between the three birders. It made a very interesting story. So interesting in fact, Pulitzer Prize winning author Mark Obmascik wrote a book about it called The Big Year. The book caught the eye of the people at Twentieth Century Fox. They made it into a movie, also called The Big Year. The movie stars Steve Martin, Jack Black and Owen Wilson as the three birders doing a big year. The Jack Black character was based on Greg Miller and his escapades during his big year. Greg told the festival attendees his amazing and humorous story about doing his big year, having a book written about it, and being involved in the movie. Greg was asked to be a bird consultant for the movie. He was not sure if his consulting duties would entail meeting any of the stars or not. As it turns out, Jack Black had never portrayed an actual person before. So Jack wanted to get to know Greg and they actually did some birding together. Wow, can you imagine birding with Jack Black! Greg tells a very funny story about getting to know Jack. He eventually got to meet Steve Martin and Owen Wilson as well. Greg is a fantastic story teller. He had the audience in stitches as he told them of his big year, well years, as it turned out. I have been attending keynotes at the festival for years and Greg’s story has to be one of the best! If you have not seen the movie The Big Year, I suggest that you run right out now and rent it! It’s a great story and an entertaining movie. 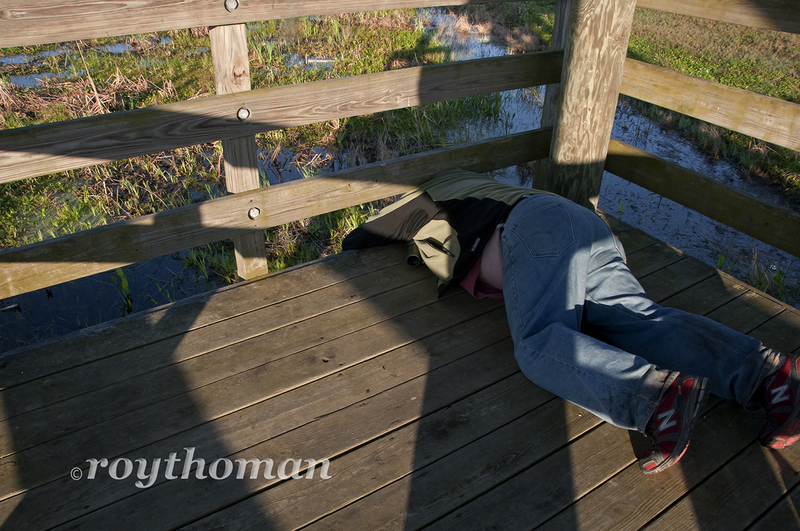 My first day as a Space Coast Birding and Wildlife Festival photographer started early. 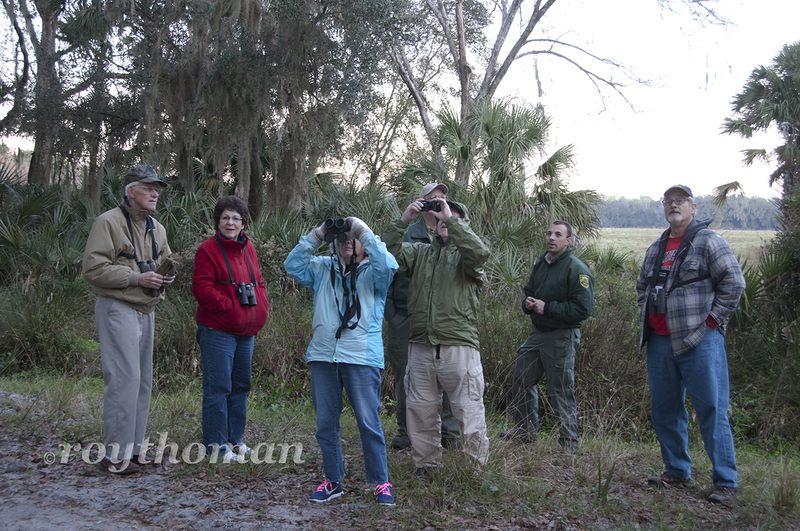 I needed to meet the birding group at 6:45am and it’s about an hour’s drive from Titusville. I needed to photograph a field trip in the Turkey Creek Tract of the Charles H. Bronson (not the actor) State Forest. I had never been to this site before, so I was eager to see what’s there. The Turkey Creek tract is smack dab in the middle of nowhere! The roads were narrow, winding and dark. I’m glad I left the house a bit early. I was the first to arrive at the meeting place. That’s good, because I have equipment to get ready and I like to have a bit of time to unwind before getting started. It was still pitch black. The stars were sparkling in the sky. The buzz of the power lines overhead was the only sound. As I got my gear ready I was listening for owls. This seemed like the perfect spot for a barred owl, but none were hooting this morning. The Turkey Creek Tract is normally closed to vehicles. You can hike the roads of the tract on foot, bicycle, or horseback. We will not need to do any of those. The festival has arranged for transportation in forest service vehicles. It pays to know people. 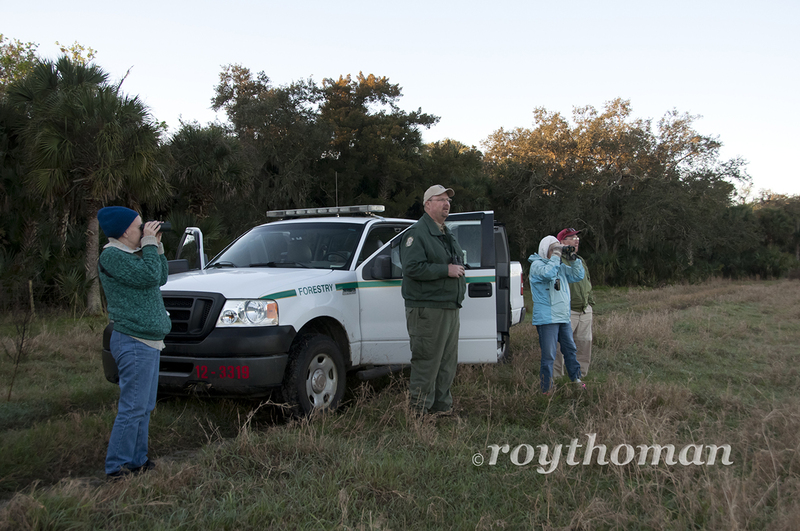 The birders and our forest service vehicles arrived just as the sky began to show the first light of the day. 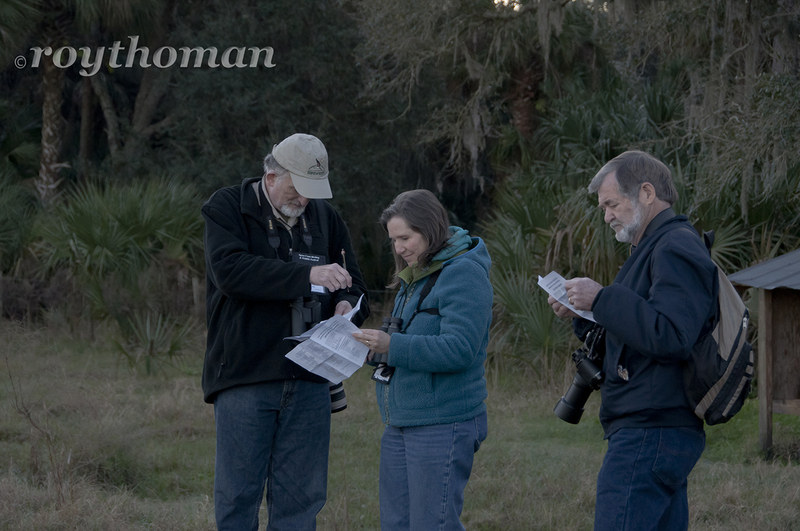 Our festival field trip leader, Dave Goodwin, of the Florida Ornithological society, instructed the group on the day’s events. Everyone climbed aboard our forest service vehicles and we were off for a day of birding! The Turkey Creek Tract has several different types of bird habitat. This is one of the reasons that it makes a great place to go birding. We stopped at each of these types of habitat to see what birds were going to say hello to us. The first and probably the best stop is in a pine forest. This particular pine forest is the home of a pair of eagles. The eagles have built their nest in a large pine tree just off of the road. We all got out of the vehicles to look at the nest. The female sat on a branch just beside the nest. The male was flying from tree to tree to get a better look at all of us getting a look at them. 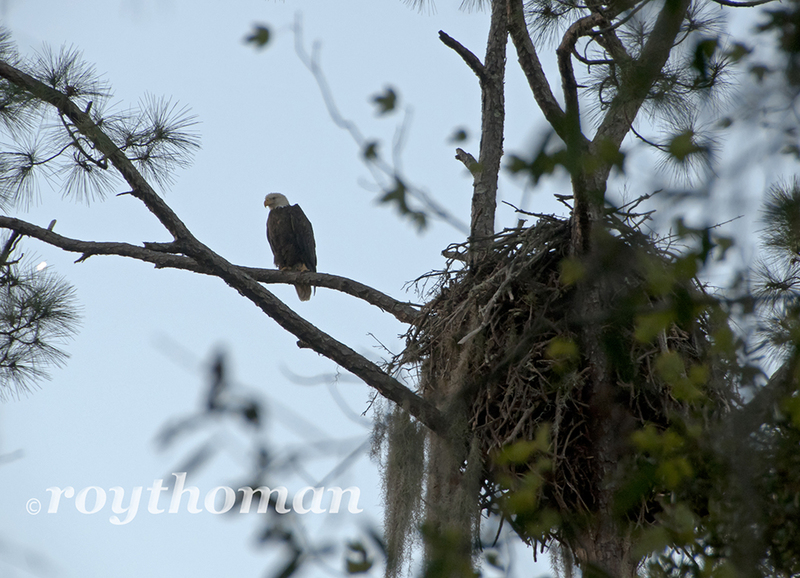 We couldn’t see inside of the nest, but at this time of the year they should have a few eaglets. The eagles were talking to each other as the male flew from tree to tree. No doubt he was making fun of us silly humans watching them. Before I got too caught up in watching and listening to the eagles, I remembered I’m here to take photos of the birders birding. The sun was not quite up yet so this proves a bit of a challenge. I needed to increase my ISO and even then it was hard to get a fast enough shutter speed. 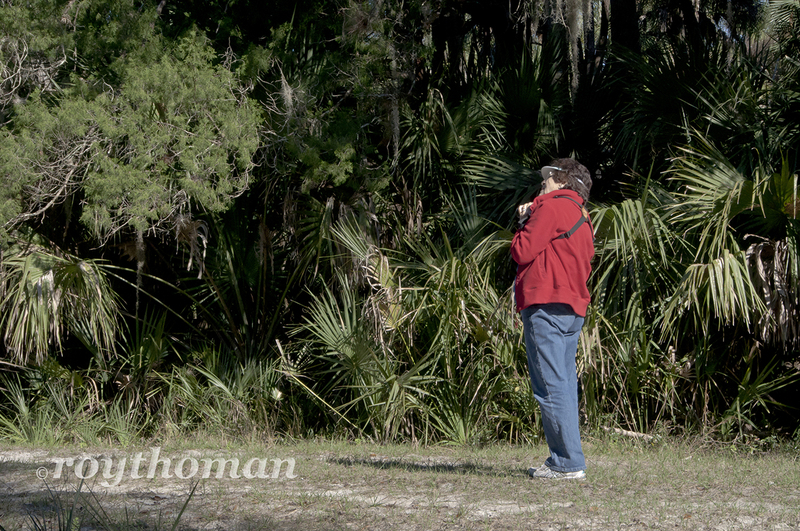 The birders were moving around and looking through their binoculars to get a good view of the eagles. I didn’t think it would be proper to ask them to stop moving around. I managed to get a few “OK” photos before we decided not to wear out our welcome and move along. It was so early I didn’t think that any of the other birds were out of bed yet. A good part of the Turkey Creek Tract is pasture for grazing cattle. The cattle were not the only animals grazing in the pastures. There were several small herds of deer as well. Probably the most deer I have seen in one place in Florida. Sandhill cranes were also grazing in the pastures. I see them all the time, but to out-of-town birders it’s quite the sight. We stopped alongside of a grassy meadow to get a look at some sparrows and meadowlark. The St. Johns River marks the eastern most border of the Turkey Creek Tract. We made two stops along the river. The St. Johns River is a great habitat for lots of shore birds, ducks, gulls, and herons, not to mention alligators. Fortunately, we didn’t run across any gators on this trip. The highlight of the St. Johns River stops, for me anyway, were the large flocks of white pelicans. The white pelicans are one of my favorite winter visitors to our area. Unfortunately, they were out of camera range, so I was unable to get any photos of them. There were also several varieties of warblers and a kingfisher entertaining us as they were fluttering from shrub to shrub. A special thanks to Dave and Stephen, (in the green jackets) our Forest Service drivers. Not only for driving us around, but they told us all kinds of interesting things about the area. The last habitat on our tour of the Turkey Creek Tract is a hardwood hammock. The hammock is a great habitat for warblers, vireos, and many other birds. We got to see some white eyed vireos and blue-headed vireos. A red-shoulder hawk stopped by to see what we were up to. A few eagles circled overhead to keep an eye on us to make sure we were staying within the guidelines of the American Birding Association. I guess we were doing OK because they moved on. 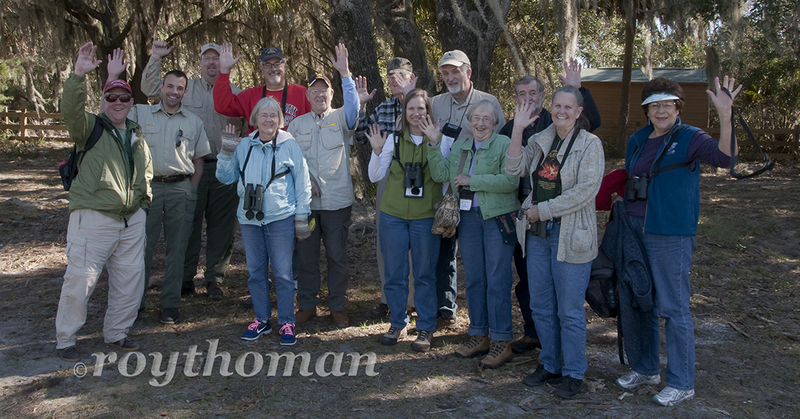 We had a great day birding at the Turkey Creek Tract. We got to see many more birds than the ones I have mentioned. The one bird that you would expect to see at the Turkey Creek Tract was a turkey. They must have heard that a group of birders was heading their way and decided they better hide. 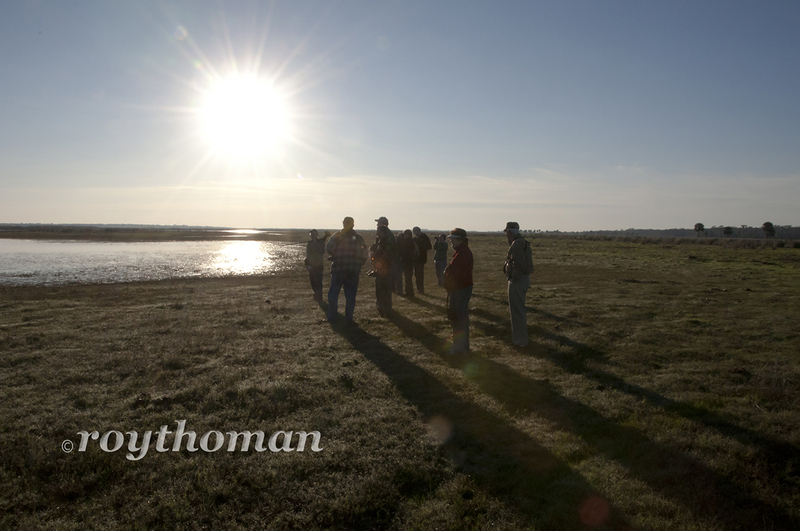 I had a great day photographing and watching the birdwatchers. I had fun bird watching too. Hmmmm, the photographer might be becoming more of birder. My day however is just getting started. I still have lots of festival to photograph. 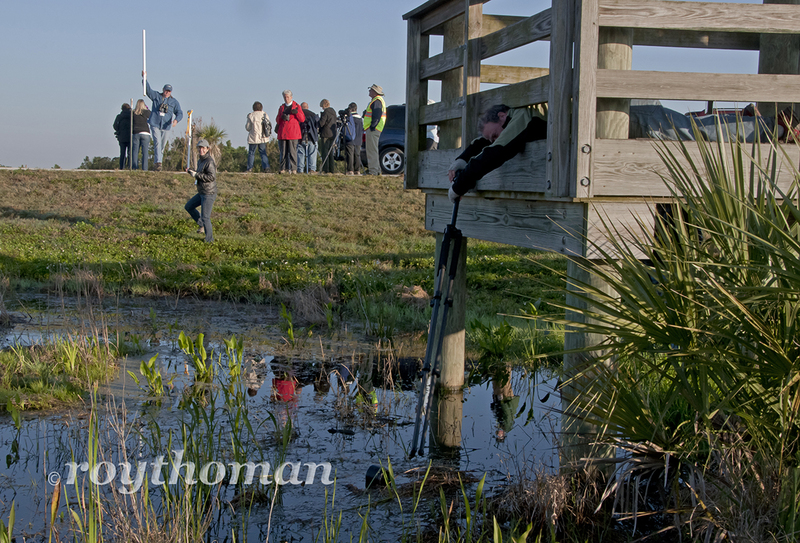 It was once again time for the 2013 Space Coast Birding and Wildlife Festival. My wife and I have attended some of the field trips, classes and keynotes at the festival for several years now. We always have a lot of fun and learn some things about birding. 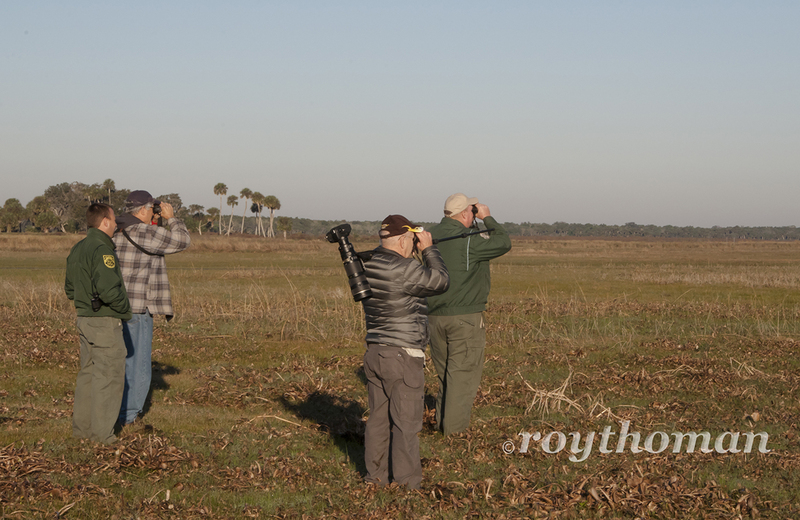 We are not your typical birders, yet anyway. We just like birds and watching birds from time to time, nothing too serious. I will always take any opportunity to get out and enjoy nature and hopefully find a few nice photos along the way. You may not be familiar with the intricacies of birding as a hobby. We weren’t either. 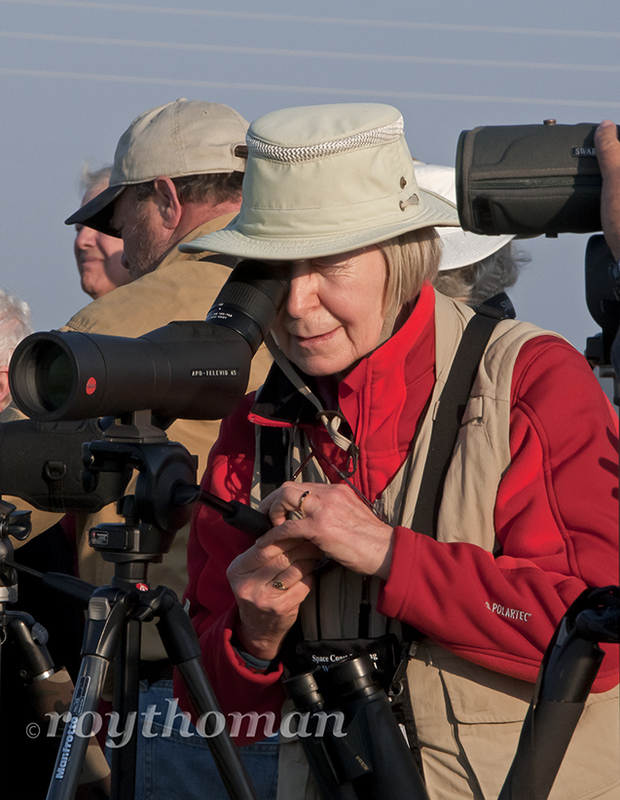 Birding as it turns out is like a sport and birders take their sport very seriously. You need a proper birding uniform and proper birding equipment. There is also a birding etiquette that needs to be followed as well. As my wife and I soon found out, birding is way more than just looking at birds. The serious birder looks a bit intimidating at first. They look very impressive dressed in khaki. Wearing their birding vest to keep all birding essentials close at hand. A big floppy hat and binoculars strapped to their chest like a bandoleer. 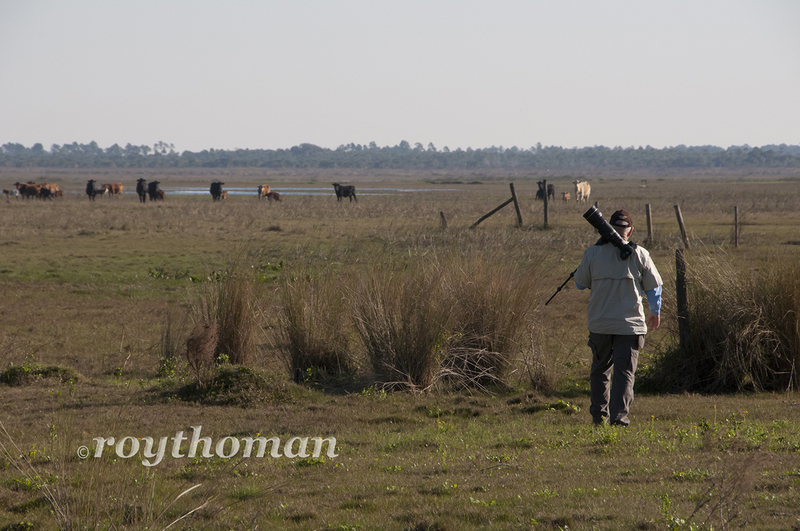 A huge spotting scope attached to a tripod, slung over their shoulder. The birder is like a warrior headed into battle, ready for anything the elements may throw at them. A very impressive sight indeed. Come to think of it, that’s how I look in the field as a photographer! Hmmmmmm, a birder is not necessarily a photographer and a photographer is not necessarily a birder. In many ways though, I think they are similar, but yet very different. There is no need to fear the serious birder. One just needs to say hello and ask them, “What did you get?” Suddenly the birder transforms from warrior, to a friendly fountain of information. Spelling out in detail the bird or birds they have seen, where the bird was, what the bird was doing, the bird that got away and any thing else you may need to know. So if you happen upon one of these warriors of the wilderness say hello and you will make a new friend for sure.